White iPhone 4 Set For April 27th Launch? A Best Buy inventory discovery this weekend points to the white iPhone 4 being launched next week on April 27! 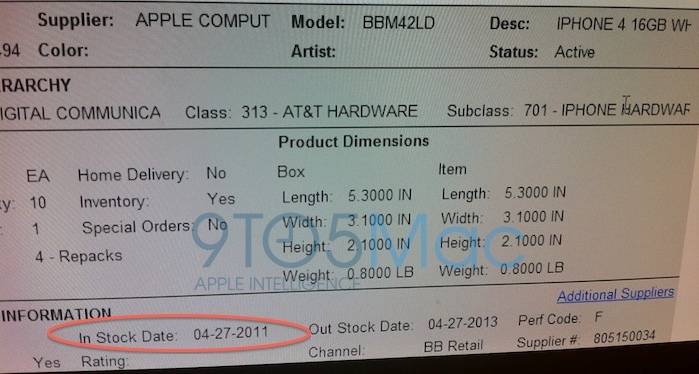 If the photos are to be believed, Best Buy’s inventory shows that, at least, the white iPhone 4 16GB for AT&T is scheduled for an April 27th launch. We’ve seen similar screenshots from the Verizon Wireless inventory system. Recently, Vodafone UK basically confirmed the white iPhone 4 launch schedule after the UK wireless carrier sold a white iPhone 4 early and then proceeded to tell retail staff not to sell any more until next week. With the anticipated September 2011 release of the iPhone 5, it is interesting that Apple is even considering launching another iPhone 4 this late into the product life cycle. Even more interesting will be the people who purchase a white iPhone 4 knowing about the rumors of an impending iPhone 5.
iPhone 4 Testing on T-Mobile USA; AWS iPhone For Canada Too?